Like Disney’s animated Robin Hood meets Ralph Bakshi movies, this one is a combination of cute and dark, but the story just doesn’t move fast enough by today’s standards. A movie about a mother trying to set out to save her children and home when she finds out a plow is coming to run right over them, this film just takes too long to get going. The whole first half is about the mission and about having to get to this special place called Nimh. The problem is that not much happens during that first half of this character, mrs. brisby, traveling. sure, she comes across a couple of different creatures (a crow, an owl), but they all just point her in the direction she needs to go. luckily, once she arrives at Nimh, for the second half, things pick up. That’s when the real story begins. The Secret of Nimh is a strange animated movie. It is one of those films that seems like it is for children (the animal characters), yet is dark and deep enough to really be for adults. As far as tone, this totally feels like a Ralph bakshi movie, and even though he did not make it, the amount of parallels are enormous. Bakshi made his movies (like fire and ice) about the art and atmosphere more than they were about the stories. The secrets of Nimh travel along that very same path. At the start of the film, we are with a mysterious creature watching a mouse in a crystal ball. The creature is making comments, speaking to someone named “Jonathan,” who it seems like is a character from this creature’s past. We certainly do not get the impression that Jonathan is there, in the room with the creature, since nobody else ever speaks. Instead, we move on to see the story of that mouse for ourselves. It turns out she is a mother named Mrs. Brisby, with a child who is sick. Right now Mrs. Brisby is out trying to get medicine for her child, and the only way to do that is to consult a wise, old medicine man (not actually a man, of course, but another animal.) she does get the medicine from this bumbling, scientist-like character, and then continues on her way. Getting back to the secret of Nimh, Mrs. Brisby returns home with the medicine only to realize that there is a new problem. This one is even bigger than the one she set out to solve. Mrs. Brisby and her children live in a box on a farm. The box is on the ground, hidden by tall grass. The problem is that the farm is about to be plowed. They keep saying, “the plow has come early this year.” in that case, what do they normally do when the plow comes at its usual time? Whatever strategy they normally use, they should just be doing it now. These questions are never answered. Instead, Mrs. Brisby sets out again, on another quest. She needs to find a solution to her plow problem. She travels along and comes upon a giant owl. The owl is very knowledgeable and advises her of an area called Nimh. He tells her that if she reaches this place, she should be able to find that answers to her problem. Therefore, brisby heads off to Nimh, and it is not long before she finds it. As it happens, Nimh is an area of super intelligent mice that have started a home together. Once she arrives at Nihm, Brisby is shocked to find that some of the characters there knew her husband. Apparently, he was a founder of this place. By the way, her husband was that Jonathan character, we heard about at the start. The mice here want to help her, but there is also a scheming situation going on behind the scenes. 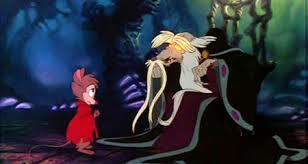 Two mice plan to take over Nimh and to kill the one in charge. We learn some back-story about the mice and how they have to be the way they are. Apparently, there was a laboratory that was doing experiments on them and kept injecting the mice until eventually the mice became super smart and escaped. Jonathan was one of the first of these super smart mice. Now, Mrs. Brisby has to sneak into the house near the farm in order to get some material that can help rescue the box where her children are. As the movie winds toward it’s climax, we get two storylines running side by side. The first is about saving the box. They need to pull it up to safety before the plow gets there. The second storyline is about those two villains, who want to kill the leader and rule Nimh. Mrs. Brisby meets the leader, who is the same character that was watching her through a crystal ball at the start of the film. The two climaxes are both pretty good and exciting. 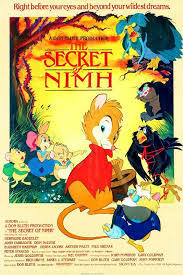 The secret of Nimh is an okay movie. It is definitely very slow moving, and that is its biggest problem. It seems that we do not actually arrive at Nimh until about halfway through the movie. That means in the first half of the film, very little happens. Mrs. brisby is out on a mission and returns home only to find a new problem and have to set out once again. Now when brisby does arrive at Nimh, the plot starts to pick up. The second half of this film definitely surpasses the first half, but even that could have been better. For example, it might have been more fun to spend a little more time with the villains and the scheme then to keep meeting big, older characters that gave brisby advice. There is no question that the wise owl and the leader of nimh (named Nostradamus), are just too similar, in both look and what they do for the story. An interesting movie just does not have the right pace. This movie definitely goes for art and aesthetic more than it goes for story.